Research proved homeopathic treatment offers fantastic pain relief as well as better mobility for Cervical Spondylitis. 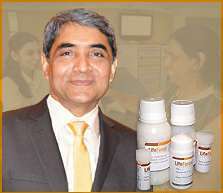 Dr Rajesh Shah, M.D.(Hom.) has been working on a range of chronic diseases including Cervical Spondylitis since 1985. His patients in over 127 countries enjoy the benefits of Dr Shah's research based molecules which have international Patents. Dr Shah's new molecules have changed the entire homeopathic treatment protocol for the treatment of chronic painful conditions. What do you expect from Dr Shah's treatment? Improvement in the symptoms of Cervical Spondylitis may be experienced in about two to three weeks. The length of treatment depends on the extent of inflammation and compression. Most patients need medication for about six to eight months.